Seaside Paphos. Photo courtesy of the Cyprus Tourism Organization. Cyprus, the birthplace of Greek goddess Aphrodite, calls to everyone in search of love. Wine and romance are entwined on this Mediterranean island, the oldest wine-producing country in Europe. Some even say that King Solomon praised its wine in his paean to love, the Song of Songs. From glistening beaches to rugged hilltop villages where sweet plums and juicy cherries grow, this island offers the excitement of water sports, the thrill of mountain driving and the peacefulness of rural vistas—just 262 miles northwest of Israel. But Cyprus is close to Israel in more ways than one. It is a land tragically divided. Muslims and Christians once lived throughout the island; but since Turkey’s invasion in 1974, Muslim Turkish Cypriots live in the north, separated from the Christian Greek Cypriots in the south by a border that is only gradually becoming permeable. Cyprus supplied copper to the Mediterranean countries in antiquity and gave its name to the metal. Cyprus and Eretz Yisrael had trade relations by the third century B.C.E., and Jews began to settle the island. In the first century B.C.E., the Roman emperor Augustus gave Herod, king of Judea, part of the management and revenue of the island’s copper mines. Jews were among the miners and copper workers. After Herod’s death, his granddaughter Alexandra married a Cypriot Jew. The community prospered, and synagogues existed in at least three locations: Golgoi, Lapethos and Constantia-Salamine. Some Cypriot Jews moved to Jerusalem, and the Talmud mentions imports of cumin, wine and dried figs from Cyprus. The Romans brutally suppressed a revolt by Cypriot Jews in 117 C.E. and forbade Jews to set foot on the island; nonetheless, they returned soon after. In the seventh century, a large community existed in Famagusta, and in the 12th century, the traveler Benjamin of Tudela found three Jewish sects on the island. Between the 12th and 15th centuries, more Jews lived on Cyprus than on any of the Greek islands. They suffered some discrimination, such as having to wear a yellow badge, but in the 14th century King Peter I attracted Jewish traders from Egypt by promising them equal treatment. Following the Turkish conquest in the 16th century, the Jewish population dwindled. When, in 1878, Cyprus came under British administration, the few Jews there were mainly silversmiths and peddlers, mostly of Sefardic origin. The late 19th and early 20th centuries saw four attempts by European Jews to settle in Cyprus, both because settling inEretz Yisrael was problematic and because the island was seen as a steppingstone toward that goal. Some Jews, including Theodor Herzl, even saw Cyprus as a possible, if temporary, Jewish homeland. Only one of the settlement attempts lasted more than a year. It began in 1900, under the sponsorship of the Jewish Colonial Association, at Margo, Kouklia and Cholmakchi, on the road between Nicosia and Famagusta. The settlers farmed field crops, grew fruit trees and raised livestock. Margo, about 10 miles southeast of Nicosia, had a Hebrew school and a ritual slaughterer as well as a Jewish cemetery. But after World War I, Margo’s second generation of Jews moved to Palestine, then under British rule. By 1928, the JCA closed down its Cyprus operation and, by 1932, nearly all the settlers had left. Five hundred German Jewish refugees found sanctuary in Cyprus during the 1930s, but the British evacuated all the Jews in 1941 to Palestine and Africa. Little remains of the settlement except for the cemetery, which is in a closed Turkish military area. After World War II, some 53,000 Holocaust survivors trying to enter Palestine illegally were deported by the British to detention camps in Cyprus. Exodus 1947, on which a revolt broke out against British policy, became the most famous of the deportation ships. In the camps, Jewish Agency emissaries and the Haganah helped organize health and education services and covert military training. The internees were released following the establishment of the State of Israel. In 1951, only 165 Jews remained on the island, engaging in citrus growing, trade, industry, farming and mining. By 1970, only 25 Jews were left. From Israel’s earliest days as a state it had diplomatic relations with Cyprus, but for many years the island’s relations with Israel were complex: In the United Nations, Cyprus often sided with the Arab states against Israel, while fostering tourism from Israel and other ties. Today, Cyprus has many ties of commerce and tourism with Israel. 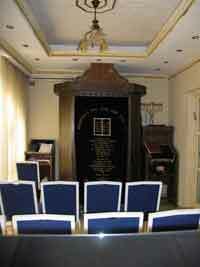 The sanctuary at Chabad House. Jewish community estimates today range from 200 to 2,000 souls, just a handful of whom were born there. Most are from Israel; the others are from the former Soviet Union, Great Britain, South Africa and the United States. Together, they are a drop in the island’s general population of more than 1 million. Until 2005, there was no communal Jewish life except for the occasional religious service and Israeli Independence Day celebration at the Israeli Embassy in Nicosia, Cyprus’s capital. Israeli-born Rabbi Arie Zeev Raskin arrived in 2005 to open Chabad House in Larnaca. He runs a complex operation that includes a daily minyan, Shabbat and holiday services and meals, production of kosher food and wine, Torah and Judaism classes, a Sunday school, an online school for older children and aid to Cypriots seeking medical treatment in Israel. He also does outreach at a hummus-and-Internet hangout in the beach resort of Agia Napa, attracting hundreds of Israelis in the summer. The Hebrew Web site www.israelisincyprus.com offers tips for Jewish-Israeli residents, businesspeople and visitors. A tour of “Jewish” Cyprus will take travelers almost exclusively through the southern, Greek-controlled portion of the island. A small Jewish cemetery surrounded by a wall and marked only by a small sign is located off the coastal road just east of the Larnaca airport. It has existed since 1873, though the oldest date visible on a tombstone is 1900. It contains nine graves and is still in use. Continue on the coast road toward Larnaca, turning right at the New York Restaurant. Continue straight down this road and take the second left. Chabad House, surrounded by a brown wall that effectively hides the building, is the second house on the left, with a sign over the door. The ground floor includes a small sanctuary and a large hall where festive meals are served (Diogenous 7B; 011-356-248-28770; www.jewishcyprus.com). Continue into town to reach the port, where a plaque—a lone bit of commemorative evidence of the detention camps—is found. At the dedication in June 1998 by the Jewish organization Keren Hayesod–United Israel Appeal, Cypriots were thanked for their friendship during that painful period. An hour’s drive will bring you to Nicosia. Here, in the Cyprus Museum, warriors, minotaurs and charioteers stand side by side in a huge display of terra-cotta votive statues from the seventh and sixth centuries B.C.E. (1 Museum Street; 357-224-03112). 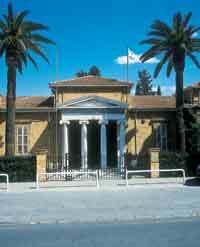 Established in 1882, it is the oldest and largest archaeological museum on the island. It is home to the most extensive collection of Cypriot antiquities in the world, displayed in chronological order from the Neolithic period to the early Byzantine period (5800 B.C.E. to 300 C.E.). Among the Greek inscriptions in the museum’s collection that relate to the Jewish presence on the island is a stone column from Athienou. Various sources give its date as the fourth, fifth or sixth century C.E. According to one source, the inscription records the third-century C.E. renovation of a synagogue, indicating that Jews were allowed to resettle in Cyprus after the suppressed revolt. Turn left as you leave the museum and left again at the corner onto Omirous; bear left on Eyiptou, following the old city wall. Cross the intercity bus station and turn left to reach Konstantinou Pallailogou and City Hall (on your right), where you are likely to bump into Israelis who have come to get married. Many Israelis, especially new immigrants from the former Soviet Union, cannot marry in Israel because they do not meet the requirements of the Orthodox rabbinate, which controls Jewish marriage. And even some of those who do meet the requirements prefer to avoid the rabbinate. A popular alternative is a civil marriage in Cyprus (which Israel is obligated to recognize), and travel agencies offer all-inclusive Cyprus wedding packages at various locations on the island. (A small number in the latter category have been married by Raskin.) According to one estimate, 3,500 to 4,000 Israelis per year marry in Cyprus. Turn right as you exit City Hall and continue on Konstantinou Pallailogou. Turn left on Trikoupi, right on Xanthis Xeneriou and left on Patriarhou Grigorio to reach the Archbishop Makarios Cultural Center (357-243-0008; www.makariosfoundation.org.cy). The exhibition of Byzantine icons on the ground floor is a good place to start one’s education in Byzantine representations of Hebrew Bible figures and scenes. One of the most striking icons is titled The Burning Bush. This 18th-century painting depicts Moses repeatedly in a circular pattern: removing his shoes, going up to Mount Sinai and finally reaching up to God to receive the Ten Commandments. Nearby, in a niche above the archbishop’s throne, the 14th-century fresco shows Aaron holding a talit and rods. Portraits of Hebrew Bible figures are also in the exhibition of mosaics that were looted after the Turkish invasion and later recovered. The detention camps set up by the British stretched from Dhekelia, on the coast about 13 miles northeast of Larnaca, to Xylotombou, about two miles away. At the end of 1948, 40,000 internees inhabited the camps. But there are no plaques or signs to indicate what the few remaining structures were. Having explored the coastal areas and beaches, be sure to drive up to the craggy Troodos Mountains. Here you will find wineries, including the Lambouri Winery in Kato Platres on Wine Route 4 (357-700-09463; www.lambouri.com), where Chabad produces its kosher dry red boutique wine, Ya’in Kafrisin. In antiquity, yayin kafrisin (Cyprus wine) was an ingredient in the incense used in the Temple. Hike on Mount Olympus and enjoy views down to the Mediterranean. Also, discover the wealth of Hebrew Bible figures and scenes depicted in well-preserved medieval frescoes in the 10 Byzantine churches declared UNESCO World Heritage Sites. The scenes that appear repeatedly include Abraham and Sarah welcoming the three angels; the sacrifice of Isaac; and the resurrection, in which Adam, Eve, Cain, David and Solomon are the first to be raised. Also, there are individual portraits of Hebrew Bible figures; Kykkos Monastery has wonderful mosaics of Moses and all the prophets, as well as another rendering of the burning bush. David Raziel, commander of the Irgun, one of the Jewish underground organizations in Palestine, was killed in Iraq in 1941. In 1955, his remains were exhumed and reburied in a Jewish cemetery in Cyprus; in 1961, they were reinterred in Jerusalem on Mount Herzl with state honors. David Slonim, who died in 2005 at age 100, was the first to grow grapefruit on the island. He established the Cyprus Palestine Plantation. Businessman and Hollywood producer Avi Arad, a megaproducer of superhero-themed films such as Spider-Man, was born in Cyprus and grew up in Israel. In a rare diplomatic act by Israel, Greek Cypriot businessman Prodromos Papavassiliou was named honorary consul in 2005 for helping the Jews interned in detention camps, especially for smuggling them in and out at great risk to himself. The 1958 novel Exodus (Bantam) by Leon Uris was made into a movie directed by Otto Preminger and starring Paul Newman. The film opens with the arrival of Jews in Cyprus. It was filmed on the island and in Israel. Place Of Refuge: A History Of The Jews In Cyprus by Stavros Panteli (Elliot & Thompson Limited) uses memoirs of detention camp residents and of the descendents of Jewish settlers, among other sources, to document the history of Jews in Cyprus. Gary Gumpert and Susan J. Drucker are working on the documentary Cypriot Memories Forgotten (http://gumpertdrucker.com), which deals with the historical significance to Cyprus of the British detention camps. In Bitter Lemons (Axios Press), Lawrence Durrell tells of his experiences on Cyprus between 1953 and 1956, first as a visitor and teacher and finally as press adviser to the British government during an armed rebellion. His is perhaps the most famous description of the island and its politics. With grace and humor, Durrell describes the villages and the people, the landscape and the sea, and the political tragedy that divided the island. Closed Doors: An Answer to Bitter Lemons by Lawrence Durrell (Nostos Book) , by Costas Montis (translated from Greek by David Roessel and Soterios Stavrou; Nostos Book), recounts the struggle for the independence of Cyprus, from the point of view of a Cypriot. Death in Cyprus: A Novel by M.M. Kaye (St. Martin’s Minotaur), set during the British period, is a mystery in which a young woman tries to find out who poisoned her aunt, set against the sun and sand of the island. Several airlines fly from the United States to Cyprus via Europe. Israel is less than an hour’s flight to Cyprus. 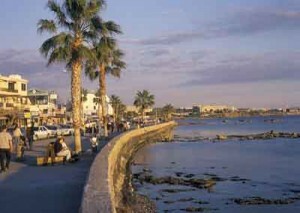 Visitors with a yen for beaches will find a wide variety of accommodations in Agia Napa, Paphos and other resort areas. But to get away from the crowds, try the many types of accommodations in the Troodos Mountains. Treis Elies is a small village not far from Platres, the mountain resort town: There, the restored traditional house To Spitiko Touy Archonta has eclectic but tasteful and comfortable furnishings and is an excellent base for tours and hikes. Proprietor Androulla Christou has a wealth of information and cooks delicious dinners of local trout and vegetables (357-995-27117; www.spitiko3elies.com). Visitors to Larnaca will find accommodations within walking distance of Chabad House at the Amorgos Boutique Hotel (357-246-21900; www.amorgoshotel.com). The Chabad Web site has additional listings. Kosher meals on Shabbat are available at Chabad House; with advance notice, Chabad will also deliver kosher meals to hotels in Larnaca. Fresh vegetables and fruit (especially watermelon and cherries) in Cyprus are a delight, as is the locally farmed pink trout. And in the Troodos Mountains, with a glass of kosher Cypriot wine or hearty Cypriot beer, a bowl of fresh cherries and a good book, you can easily imagine spending weeks on this sun-kissed island. Esther Hecht blogs about her travels at www.estherhecht.wordpress.com.